PNG Police Commmissioner Gari Baki officially announced the death of Assistant Commissioner of Police Teddy Tei who died in a tragic car accident in the Western Highlands in the early morning hours. "I regret to announce that ACP Tei died after a fatal road accident in the early hours of this morning. This is shocking news for the RPNGC and the nation," Commissioner Baki said. Mr Tei was recently appointed commander for the newly established Highlands-Western command based in Mendi in the Southern Highlands Province. He was also the former Highlands regional commander until the recent split of the command. 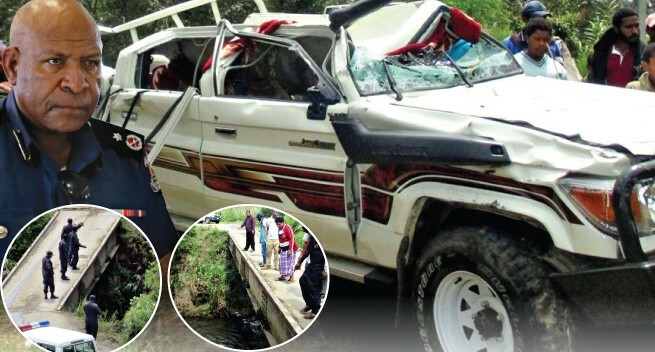 According to Western Highlands police Mr Tei was travelling to his home village in Bukapena in Mul District from Mt Hagen during the early hours of yesterday when his vehicle ran off the narrow and railless Gomanz bridge. Police said he was travelling alone and his body was still inside his vehicle under the flood waters of Gomanz river until it was discovered several hours later in the morning between five or six o’clock by people who were travelling to Mt Hagen. Police said Mr Tei was already dead when he was discovered and his body was taken to the Mt Hagen general hospital morgue while his vehicle was towed away to his home. Police said the late Tei’s immediate family members and his Nenga Andakomon tribesmen remained shocked yesterday and could not digest the fact that a senior citizen member of the police force in the country was dead. Colleague and Western Highlands provincial police commander Martin Lakari said the death came as a shock to him and other senior police officers in the Highlands region. "I take this time on behalf of our policemen and women in Western Highlands to pass my deepest condolences to the family members, tribesmen and relatives of the late Mr Tei. It is not only a big loss to the families and relatives but a great loss to the RPNGC. "We lost a very smart and professional officer and his death has left a huge vacuum which would be hard to replace a person of his caliber," Mr Lakari said. A close relative John Pulgum said the unexpected death was a shocker to relatives and family members. "He was preparing for a feast for himself before heading off to Mendi to take up his new job. "We all his family members and tribesmen were happy for him but all of a sudden he is dead and we are shocked and cannot believe he is dead," he said. Police are conducting an investigation into the cause of the accident. Late ACP Tei is survived by three wives and six children.